Long before he became known for his scholarships, civic leadership, and downtown park that bears his name, J.L. “Tommy” Constant and his firm, Constant Construction, built many of the most important buildings in Lawrence: Lawrence High School, St. John Catholic School, Lawrence National Bank, Capitol Federal Savings and Loan, Hallmark Cards, West Hills Apartments, the Campanile, Smith Hall, Douthart Hall, Blake Hall. The list is extensive. Included are two houses he built for architecture professor George Beal featured on this website. Despite his tremendous accomplishments as a builder, Constant was best remembered as a community leader with a progressive attitude and a high level of integrity. His reputation was largely cemented while he was city commissioner in the early 1960s, back in the days when the Ku Klux Klan attempted to take over the city government. Based on newspaper accounts, he fought the hooded cowards to a standstill. After his death, Constant bequeathed his fortune for the purpose of educating future leaders and educators, creating the J.L. Constant Distinguished Professorship and a fellowship fund for graduate engineering students at KU, a library acquisition fund endowment, and a scholarship fund at Baker University, among many other gifts. Byron “B.C.” Sneegas was born in 1923, in Lawrence, where he graduated from Liberty Memorial High School. Upon graduation in 1940, at age 17, he enlisted in the Kansas Army National Guard. He spent 18 months fighting in Europe during World War II as a combat infantryman, landing on the beaches of Normandy on D-Day and fighting in the Battle of the Bulge where he served with the Headquarters Battery, 35th Division Artillery setting up machine gun positions. In the spring of 1945, he and other soldiers in his division helped liberate the Dachau, Germany extermination camp. After the war ended, B.C. returned to Lawrence and worked for Reuter Organ Co. before starting his own construction business, Sneegas Construction, operating during the boom years of the 1950s and 1960s. During that time he helped relocate a few German citizens to Lawrence, who helped in his business. After he quit construction, Sneegas went on to work as a machinist for the Physics Dept. at KU for 21 years, retiring in 1988. In addition to his talent as a builder, Sneegas was a silversmith who made fine jewelry and other metal works and was an original member of the Lawrence Art Guild. He passed away in 2005. Born in Lawrence in 1917, Robert Still graduated from Lawrence High School and enrolled in Architecture at the University of Kansas in 1939. When World War II broke out he left the University and enlisted in the Navy, where he received pilot training and eventually became a test pilot. After World War II, Still returned to Lawrence and joined his father, Harry, designing and constructing residential homes and commercial buildings. When his father retired, he continued Still Construction and built several houses, commercial buildings and additions in the Lawrence area. Still held a reputation for superb construction technique and impeccable finish work. He built four houses on our “Baker’s Dozen” list, more than any other builder. In the mid-1960s Still decided to complete his education postponed by WWII. In 1969, he graduated from KU with a B.S. in Architecture. After graduating he worked as an architectural project manager during the construction of the Kansas City International Airport. He was Assistant Director for the City of Lawrence Urban Renewal Program and worked as an Improvement Analyst for KU’s Facilities Planning until his retirement in 1987. He died in 1999. John F. “Johnny” Kapfer was a hard-working, exacting builder from the ‘Old School’. 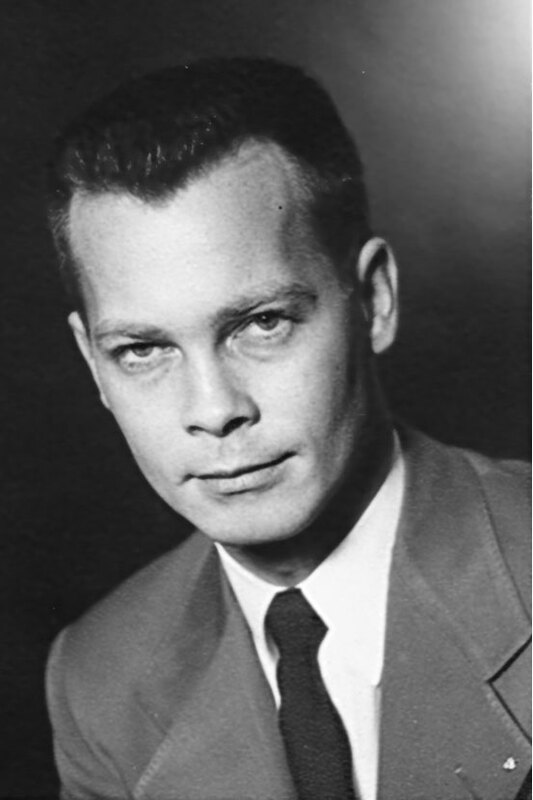 Born in Page City, Kan., in 1926, John grew up in Lawrence and graduated from Liberty Memorial High School in 1943, whereupon he was drafted into the U.S. Army Air Corps, serving briefly as a test pilot during World War II. After graduating with a degree in architectural engineering from KU in 1949, he took over his father George’s construction business, Kapfer Construction, and secured numerous local commercial contracts, most prominently the Hillcrest Shopping Center complex, which his firm designed and built. Though Kapfer built relatively few private residences, the ones he did build have aged well, particularly the Frank Burge and Meyer Litwin family houses designed by architect Robert Hess in the early 1950s. Upon the dissolution of his business, Kapfer worked as Director of Maintenance and Operations for the Lawrence school district until his retirement in 1990. His wife, dancing partner, and mother of their three children, Johanne, died in May, 2010. John Kapfer passed away on July 31, 2011. He was 85. John Churchill Sargent was a progressive residential builder whose company, Jayhawk Construction, developed swaths of modern subdivisions in Lawrence and Topeka during the 1940s and 1950s. Called “Church” by his family and friends, Sargent was born in 1897, in Kansas City, Kan., and spent more than his half his career working for his family’s Topeka-based stone cutting business, the Sargent Cut Stone Company. The Sargents made a fortune in cut stone, supplying the finished product for many of the finest buildings that dot the Kansas plains, including the Kansas Statehouse, the Douglas County Court House and Haskell Indian Nation University. During high school, Sargent worked as an apprentice at his father’s flourishing plant on Adams Street, and later joined the Navy during World War I, where he served as a Musician with the Navy Band, then conducted by composer John Philip Sousa. After the war he returned to Topeka and partnered with his father, John Richard Sargent, eventually taking over the family business. When the Great Depression put a virtual freeze on the demand for cut stone, he shifted course and formed Jayhawk Construction in 1941, shrewdly positioning himself for the postwar construction boom. Drawing inspiration from Joseph Eichler, the influential builder of modern style tract houses in California, Church sought to make modern architecture affordable to the local public. He hired a respected Topeka architect, James R. Cushing, to design the houses, which were dubbed “Space Homes,” and priced them around $15,000. (The largest contiguous Space Home development in Lawrence is on Murrow Ct. and Madeline Ln. south of 9th St.) In all, Jayhawk Construction built more than 4,000 residences, apartments, townhouses and other commercial buildings from the 1940s to the 1970s. Though Space Homes never achieved large profits for Church Sargent, and none are featured on our Baker’s Dozen list, they collectively add a shiny veneer to the golden age of midcentury modern architecture in Lawrence. Stone mason, carpenter, entrepreneur, real estate agent, mortgage investment broker, developer and builder, John “Church” Sargent died on December 4, 1974.